Between 12 and 18 March, Cairo saw a unique artistic event. Coming at the threshold of what might be considered the festive season with the greatest assortment of artistic festivals in the year, the Hakawy International Arts Festival for Children brought theatre performances to the Hanager Theatre on the Cairo Opera House grounds. This annual event is organised by AFCA for Arts and Culture, an institution founded by Mohamed El-Ghawy in 2004 with a simple yet powerful mission: to educate children and young people in the art and culture in Egypt. With its new headquarters at the Concordia-Lycée International Français en Egypte, a school located in the New Cairo’s Fifth Settlement (El Tagamoa El Khames) and implementing the French primary and secondary curriculum, over the past years AFCA has developed many artistic workshops and programmes in French, English and Arabic that include theatre, dance, singing, visual arts and even cooking tailored for schools and smaller groups such as families or groups of individuals. The Hakawy International Arts Festival for Children is one of AFCA’s biggest projects since 2011, and it is a fascinating extension of the many years of valuable activities offered by this institution to Egyptian children. It brings a multitude of values to Egypt, a country that still suffers from very limited offerings for the youngest audience. As El-Ghawy (who still heads AFCA) stresses, theatre for children can not remain restricted to the single well-known Egyptian puppet operetta El Leila El Kebira (Anniversary Night), repeatedly performed by different troupes. On the other hand, the once renowned Egyptian puppet theatre does not promote its activities sufficiently. 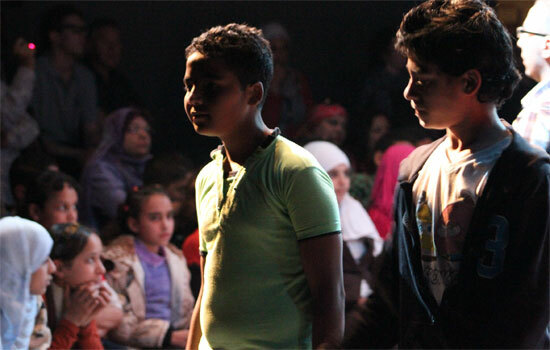 The sporadic theatrical performances targeting the young audience held by some independent institutions are a drop in the ocean of the needs of Egypt’s children. Sadly, the negligence in arts education crosses over into other creative sectors. 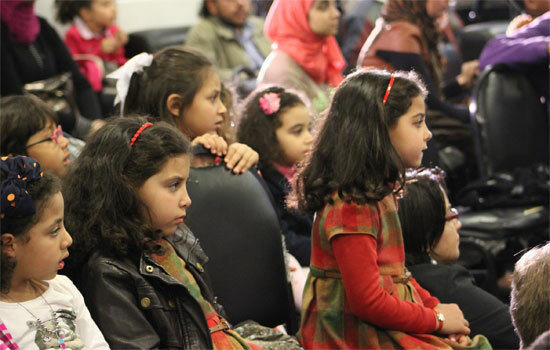 Last year’s annual Cairo International Film Festival for Children was halted, without any explanation from its organiser, the Cultural Development Fund, an arm of the Ministry of Culture, and we’re still awaiting news of its possible 2014 edition. Under such unstable circumstances and in the absence of sufficient efforts to bring valuable events to the youngest audience, the Hakawy Festival sustains our hope that, while neglected by governmental bodies, education of children through the arts will not be forgotten by independent artistic players. “Children have the right to attend the town’s artistic and cultural institutions, both with family and school, in order to discover and experience what the area offers them.” This is one of the 18 principles enumerated in the Charter of Children’s Rights for Arts and Culture, created by the European Network for the Diffusion of Performing Arts for Early Childhood. It is also the motto of the Hakawy Festival which this year came back with fascinating programming and a few logistical developments. For instance, this is the first time the festival has introduced ticketing, a requirement placed on the organisers by the Egyptian Ministry of Culture which controls Hanager Theatre, its core location. But Mohamed El-Ghawy set a symbolic price of LE 5: less than $1; he also encouraged supporting children who might find it difficult to pay this fee. “If you want to give access to underprivileged children, you can buy more tickets and leave them at the Box Office,” the festival’s promotional material emphasised. In order to further facilitate access, El-Ghawy, supported by UNESCO, organised buses to bring children from a variety of schools and locations. All would have been just perfect with this year’s edition if not for the unexpected intervention of the Ministry of Culture, which informed El-Ghawy on short notice that he needs to postpone the performances scheduled for the evening of Thursday 13 March. The reason? Security on Art Day, to be attended by the Interim President Adly Mansour at the Cairo Opera House. Though returning after a 33-year hiatus, Art Day is undeniably a glorious concept that one cannot really object to, yet better coordination on the part of its organisers would have saved many children awaiting the Hakawy theatre performances a major disappointment. The Hakawy (or “Stories”) Festival is about telling stories to children through a variety of performing tools. The first Hakawy Festival held in 2011 relied on simple storytelling, the second stressed the importance of language and education, and the third introduced music and rhythm. This year, the performances told stories through movement and dance with troupes from the USA, the UK, France, the Netherlands, Germany and Egypt. Each performance was rich in movement and visuals, filled with tools that stimulate the imagination and provoke thought. Some plays relied on traditional theatre techniques that create clear boundaries between actors and audience, others broke “the fourth wall” altogether, choosing a more relaxed approache, and at times the actors went as far as inviting the young viewers into a controlled degree of participation. Varying in theatrical tools of storytelling in action and carrying an array of thematic content, each of the performances offered a unique experience. 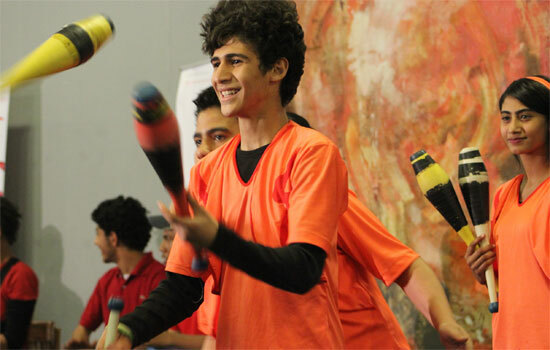 Throughout one week the young viewers were transported from circus tricks (the Al Darb Al Ahmar Arts School show from Egypt), lifesize puppets, games and imaginary shapes (Frogz from the USA), to the contemporary dance (Madcap from the Netherlands), games with food (Yummm! from the UK), and experiments with paint (Uccellini from France), among others. The opening night offered a wonderful show by Al Darb Al Ahmar Arts School. Founded in 2011 by Al-Mawred Al-Thaqafy (Culture Resource) with support from the Aga Khan Trust for Culture and Al-Fanar Foundation, the school teaches music and circus arts to socially and economically underprivileged children. The audience gathered in the Hanager’s hall was enthralled with children aged 8-14 presenting their astounding flexibility, agility and gymnastic coordination. The show included stilt walking, board balance, juggling, simple human pyramids and even some acrobalance – an impressive range of skills for a rather young school of arts. The circus tricks were accompanied by the performers’ peers giving the rhythm on percussion instruments or the wooden chairs. The show became a live testimony to the great abilities of young performers and the importance that circus arts represent in their lives. Also during the opening ceremony, Karim Fouda from the Oasis School and one of the AFCA volunteers gave a noteworthy piano performance to a crowd of children and their parents in the hall. 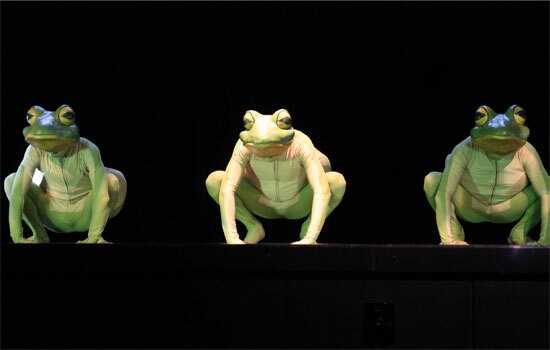 For its part Frogz, a US show by Imago Theatre based on five actors who take on different roles for their consecutive sketches, introduced lifesize puppetry, shadow theatre, black-light theatre, games with blocks, recognizable by children as animals along with imaginary shapes rolling across the stage. With no storyline and no use of language, those seemingly unrelated numbers carried the children through an elegant creative journey, simple yet brilliantly executed. Instead of searching for visual beauty, the show offered aesthetic statements, constantly shifting from the real to the imaginary. A monster-like doll playing with a giant ball took the breath of the youngest viewers with the same force as three frogs gazing motionlessly from the stage. The night of the Yummm! performance by Tell Tale Heartstroupe from UK, one was expecting the Hanager gallery to fill with toddlers. Surprisingly, the play was also attended by older children attentively following the three actresses on the stage with bright sets. The games around the theme of food turned into amusing dinnertime rituals. What made this performance especially enjoyable for the young viewers was the direct interaction with the audience, as the actors kept addressing the audience through movement and by sharing props with the children. As the festival days passed, one began to notice certain expectations that Egyptian children had of the theatre performers. It soon became obvious that Egyptian children remain mostly attentive either to shows that offer high dynamism and an element of surprise (Frogz from USA or Paradieskinder from Germany/Egypt) or ones that engaged the audience in direct interaction with the actors (Yummm!). 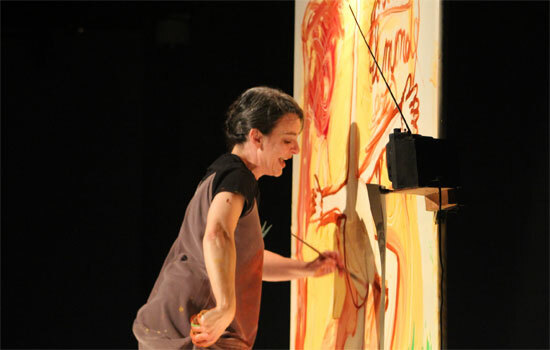 The more static and traditional solo performance by Skappa & Associes from France, Uccellini, in which a woman painter creates a drawing in front of the audience, kept the children’s attention only sporadically — during those few moments when they stood up ready to walk towards the stage. Uccellini relies on a totally visual experience and as a theatrical show it is completely enveloped within its own dramatic lines, creating a clear boundary between the performer and the viewer who is watching the painting being revealed and modified. Other shows facilitated extra curricular activities such as those drawn from the time spent attending Madcap by the De Stitle Company from the Netherlands. 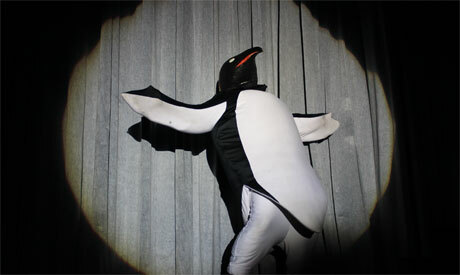 Staged at the Hanager Theatre’s main stage, this almost one hour long show utilised modern dance, a form that is not well-known to Egyptian children (and probably equally unfamiliar to many parents) to express the interaction between the three girls on the stage, toying with concepts of freedom, peer relations, friendship and jealousy. Understandably, the aesthetics that the dance presents, though very appealing at times, might be challenging for audiences that expect a theatrical formula they are used to. Though many children were obviously fascinated by this original play, it was during Madcap that not only the younger children but also their parents began chatting among themselves, apparently not interested in the events taking place on stage. As such Madcap revealed that as much as the Hakawy Festival’s journey infuses the minds of the young viewers, it also presents a challenge to the parents who are themselves neither fully prepared nor equipped with the patience to go through a valuable artistic experience. This is where the long-term benefits of the Hakawy Festival will step in. Continual exposure to artistic versatility and the highly professional shows that demonstrate it is the key to development of an equally strong audience consisting of children as well as grownups choosing to attend the performances. Hopefully the upcoming festival’s editions will face a smaller number of grownups chitchatting during the play, answering their mobile phones or persistently using cameras with flash despite the obvious prohibition. During this year’s festival AFCA presented two of their own productions: Paradieskinder (Paradise Children) and Amal Bokra (The Hope of Tomorrow). Paradieskinder is in fact a collaboration with the German Consol Theatre in Gelsenkirchen. The performance explores gender issues and the many preconceptions and behavioral expectations we formulate when looking at boys and girls; it addresses the fixed social assumptions which will often go against the nature of a child. The play relies on four actors, two from Germany and two from Egypt, who despite using sporadic bilingual dialogue remain perfectly understood by children not mastering either language. As such, in addition to thematic values, the troupe demonstrated, time and again, that language is not a barrier in a well-written and performed play; on the contrary, language is like a prop that the actors use to complement or underscore the situational aspect and specific context of the performance. While most of the performances were staged several times during this year’s festival, AFCA’s own production Amal Bokra was performed only on the final day. The play is the result of a workshop conducted by El-Ghawy with children from the underprivileged areas, students from the Alwan wa Awtar Association, the Tawasol Association and the El Thawra Experimental school. The workshop aimed at collecting the stories of the children which, with the help of scriptwriter Shadi Atef and the contribution of the poets Bahaa Jaheen and Diaa Abdel Rahman, took on dramatic form—to be performed by the children themselves. The actors walk the audience through real experiences drawn from their households, schools and streets. The shocking scenes present unfair treatment during school exams or harassment of the girls. On the one hand the play gives voice to children struggling with a multitude of hardships; on the other hand it becomes an alarming look into the realities surrounding those children. For the young actors, the play is also an opportunity to explore theatrical art and its wealth of possibilities. Performed with a minimal set, Amal Bokra relies on numerous tools such as acting, dancing and singing, revealing several interesting talents; some of the boys have striking stage confidence and a natural awareness of theatre. What AFCA might consider in the future is different casting to stress the strengths of the young actors and conceal those areas that need development. Giving large singing parts to children who can neither carry the melody nor follow the rhythm is not the best choice regardless of how, understandably, the children on stage might enjoy the experiment. Such glitches however did not take away from the general success of the performance. Time and again, one needs to emphasise the importance of AFCA’s multifaceted activities, and the spectacular effort poured into the Hakawy Festival. Hanaa Abdel-Fattah, the late Egyptian theatre critic and professor of theatre arts, once commented, “To me the child is an equal partner, a conscious recipient of values, always highly perceptive and one who senses the deceit.” No doubt, the Hakawy Theatre Festival infuses young minds with countless values and while doing so remains truthful to its core mission of providing education through art without compromising artistic quality. 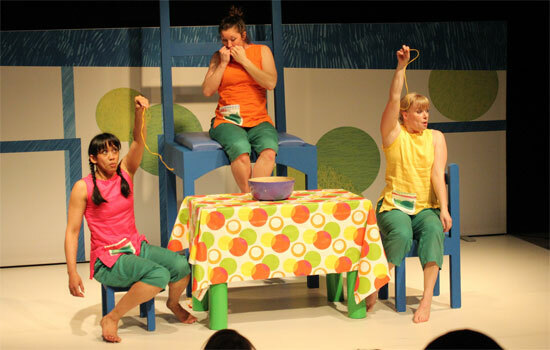 For the festival organisers the child is a partner that they take on a fulfilling journey – entertaining and thought-provoking by turns – through the wonders of theatre, the stories it tells, the life it mirrors and the lessons it teaches. Each performance is a small experience, while the whole festival and the quality it provides is a process that will eventually shape the viewers and develop a theatrical culture to be assimilated by young and old alike.